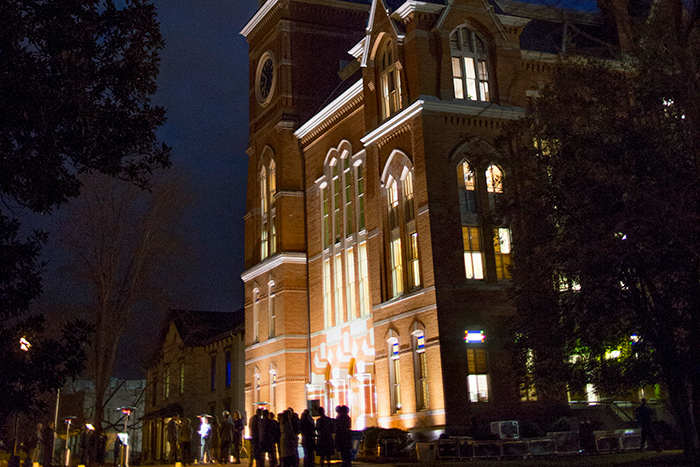 Illumination was the guiding metaphor for the Oxford campus tour, with Seney Hall cooperating fully. The Oxford Gospel Choir warmed up in front of the chapel in advance of the night’s events. With a wave of his hand, University Historian Gary Hauk signaled the Seney bell to ring 19 times, one time for each of President Sterk’s predecessors. 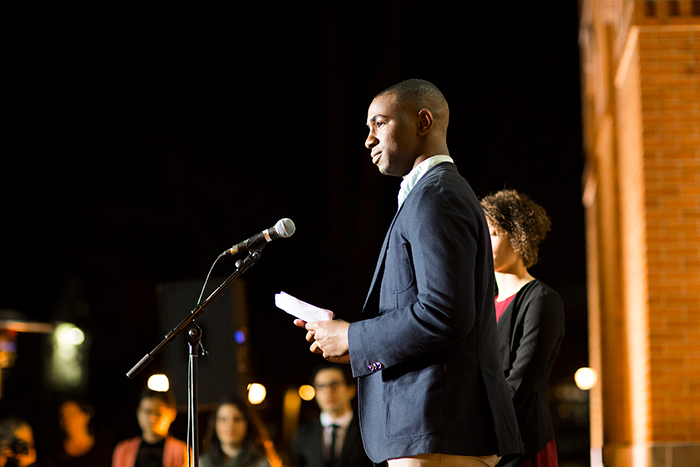 On the steps of Seney Hall, Korede Omole and Alexa Cleveland addressed the crowd. Cleveland talked about New York banker George Seney’s example, honoring young Oxford College with this building in 1881. 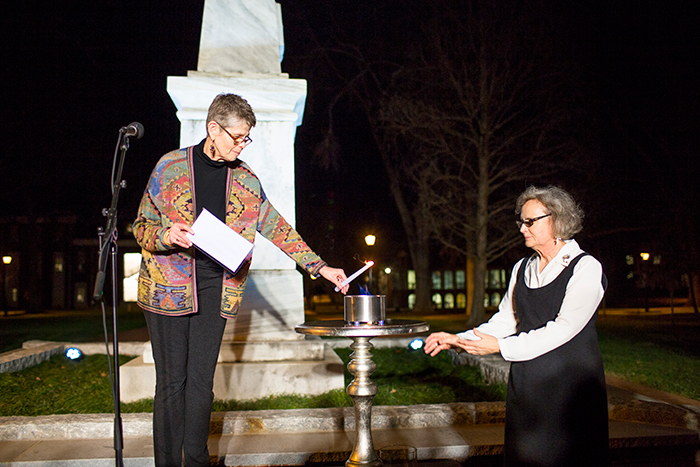 Professors Bobbi Patterson and Eloise Carter lit a flame at Few Monument representing the lamp of learning. 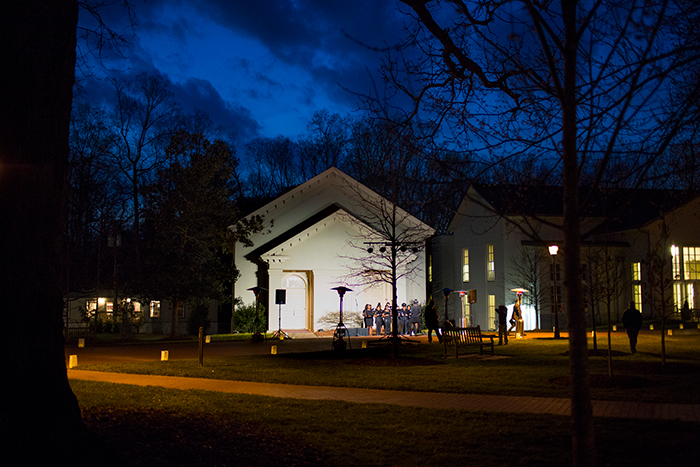 Student musicians accompanied the Oxford Chorale, which performed “Now Is Our Time” in front of Phi Gamma Hall. 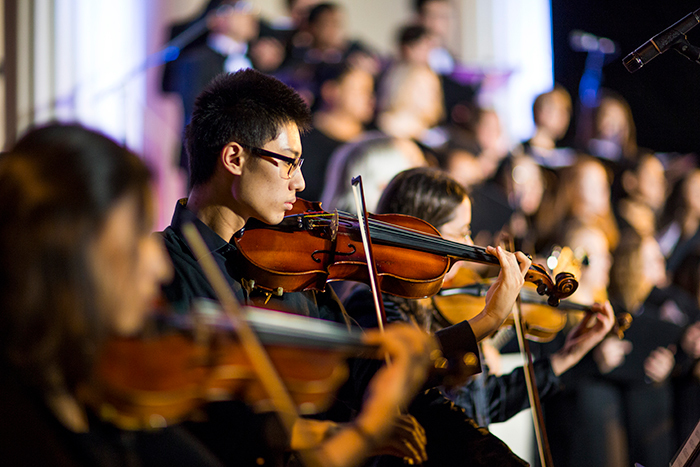 The song was composed by Oxford history faculty member David Leinweber. A dessert reception in the Oxford Library followed the tour. Emory celebrates a new chapter in its history with the inauguration of President Claire E. Sterk. Three days of events culminated with her formal inauguration ceremony on Wednesday, Feb. 8. On Wednesday, Emory marks the inauguration of President Claire E. Sterk with a formal investiture ceremony and other campus events. To watch a livestream of the ceremony as it takes place, visit the website of the Office of the President. • Inauguration of Claire E. Sterk, 20th president of Emory University, Glenn Memorial Auditorium, 10-11:30 a.m. This special convocation blends Emory traditions and modern ceremonial elements. Emory neurosurgeon and CNN chief medical correspondent Sanjay Gupta provides the keynote address. 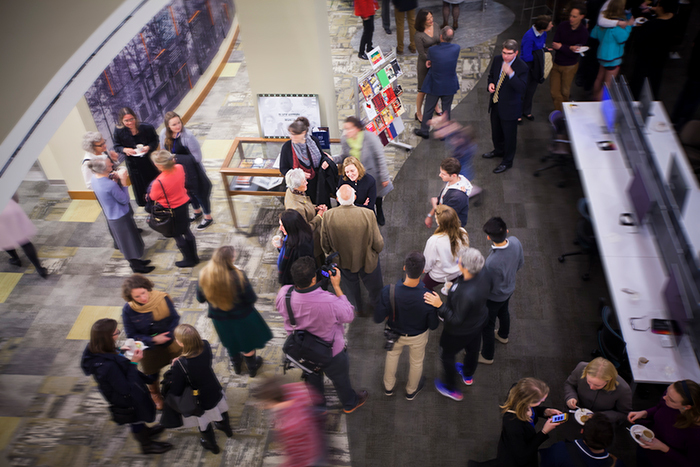 The program includes a performance by the Vega Quartet and a poem by Kevin Young, University Distinguished Professor and Charles Howard Candler Professor of Creative Writing and English. Tickets are required. • Wonderful Wednesday, Asbury Circle, noon to 2 p.m. The student body is invited to join in a casual inauguration-themed gathering. • Tree planting, Emory Quadrangle, 2:30 p.m. In honor of President Sterk and in celebration of Emory’s commitment to sustainability, the campus community is invited to attend a tree planting on the Quad. Given the season, the winter doldrums could have prevailed. Indeed, heat lamps and cups of hot chocolate were on hand just in case. Founders Day marks the first meeting of the Emory trustees, held Feb. 6, 1837, at which the board officially accepted land belonging to the Georgia Conference Manual Labor School on which to situate their “contemplated college” and the new town of Oxford. 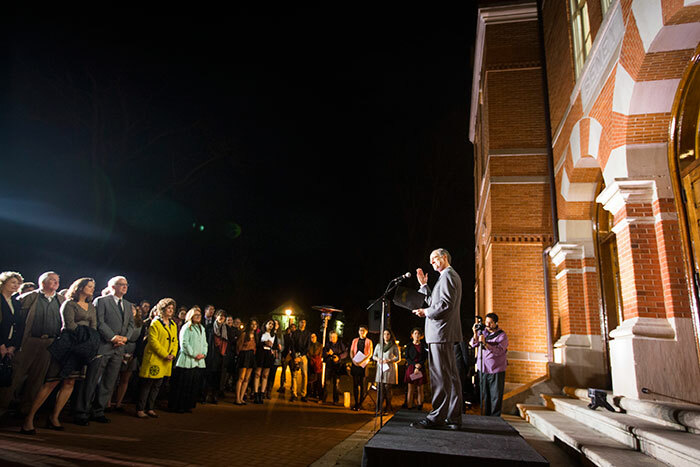 The topic of contemplation last night, exactly 180 years later, was the remarkable perseverance of Emory's shared values and the enthusiasm that attends opening a new chapter in the university's history. University historian Gary Hauk, the next speaker, controlled the best sound effect of the evening — the tolling of the Seney Hall bell, which rang 19 times to signify Sterk’s predecessors. Hauk’s remarks emphasized the need both to honor traditions and, where possible, extend them to create modern-day relevance. Consider the peregrinations of the bell, a gift from Alexander Means, the fourth president of Emory College. It graced Oxford’s original administration building; however, when the structure was razed, the bell dangled from a tree on the Quadrangle. Now in a place of honor atop Seney Hall, the bell will toll 20 times via Facebook Live during the president’s Wednesday investiture ceremony in Glenn Memorial Auditorium on Emory's Atlanta campus, nearly 40 miles away. Muhammad Naveed, president of Oxford’s Student Government Association, introduced fellow students Korede Omole and Alexa Cleveland. As Naveed led the tour, which included Few Monument, Phi Gamma Hall and the chapel, 180 luminaries lit the way, one for each year of Emory’s history. 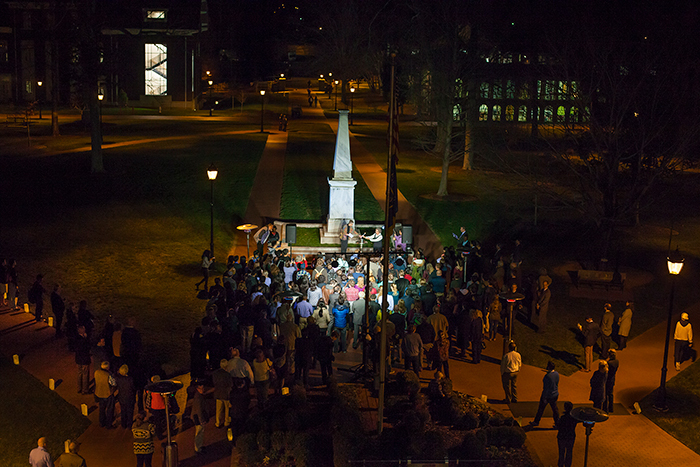 At Few Monument, faculty members Bobbi Patterson, professor of pedagogy and chief marshal of the university, and Eloise Carter, biology professor and Oxford faculty marshal, greeted the assembled. The two, respectively, are the 2015 and 2016 recipients of the Thomas Jefferson Award, given to honor faculty and staff who significantly have enriched the intellectual and civic life of the Emory community. 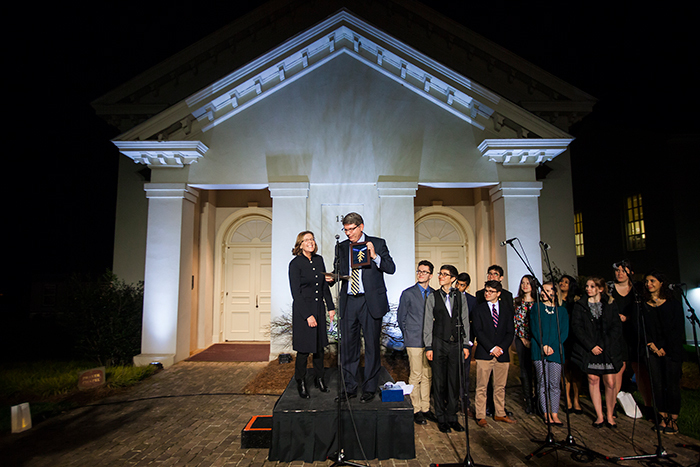 Patterson and Carter lit a flame, representing the lamp of learning, which will be preserved and presented to Sterk at her inauguration. Answering the “call to remember,” Oxford student Kristina Jespersen greeted the crowd in front of Phi Gamma Hall, Emory’s oldest academic building, constructed in 1851. As with the bell, the emphasis was on adaptability, for what began as the home of the student debate society morphed, by 1864 and the ravages of the Civil War, into a hospital for the wounded following the Battle of Atlanta. As Jespersen concluded, the Oxford Chorale sang “Now Is Our Time,” composed by David Leinweber, associate professor of history at Oxford, who accompanied the group on guitar. The tour wound up at the chapel, where the Oxford Gospel Choir performed “O for a Thousand Tongues to Sing.” Student Yi Xie, answering the “call to serve,” noted that “learning occurs in the context of relationships that must be recognized, respected and challenged. 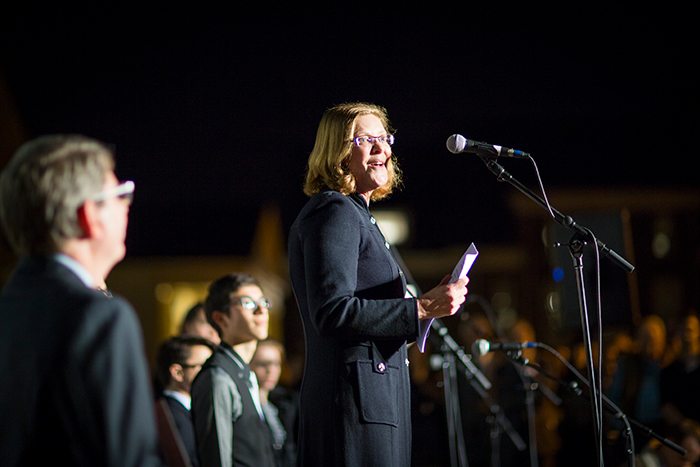 Emory’s 20th president then promised, come the tolling of the 20 bells on Wednesday, which she termed “a tuneful message of our strength and optimism going forward,” to recommit to Emory’s historic mission, all the while staying bold and taking responsible risks.